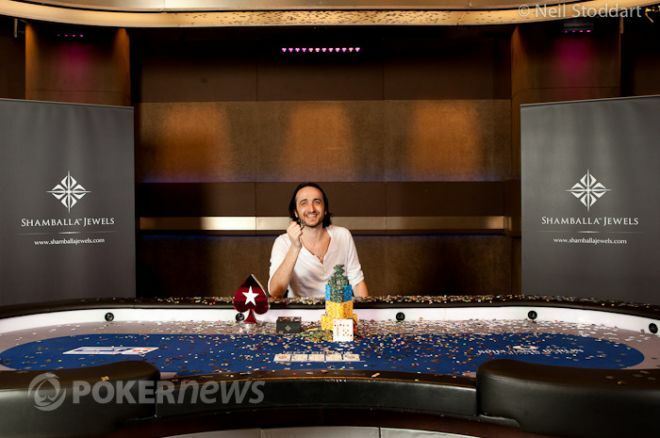 Davidi Kitai has become the first ever Belgian player to win a PokerStars.com European Poker Tour, after he defeated Andrew Chen in an epic heads up battle to claim the trophy, a Shamballa bracelet worth more than €10,000, and a seat at the season-ending €100,000 free-roll Champions of Champions Event. We’ve used the word epic before during this season to describe the many long heads up battles we’ve seen, but on Saturday, we use it to describe the sheer quality of the poker on show. Many here have commented how they believe that the heads up battle here was the best of the season. There were five-bet jams preflop, check-raise river bluffs, three-bet three street bluffs, and brave all-in river calls with marginal hands. The most memorable hand from the many great hands that were played happened when Kitai open with and called when Chen three-bet to 900,000 with . Chen led for 615,000 on the flop and Kitai called, as he did when he was faced with a 1,480,000 bet on the turn. The fell on the river and Chen moved all in for his remaining 11,190,000. Kitai was covered and called all in after tanking for three minutes. The consensus was that he thought king-high was good enough and he may well have called if the river bricked. With this win, Kitai has become the fifth player to complete poker's Triple Crown. Play was aggressive from the beginning of the day and thanks to the card-up broadcast on EPT Live, it was apparent that the players' range was wide, as was the three-bet range. The first elimination occurred when Bahadir Kilickeser three-bet Pratyush Buddiga with . No one was expecting Kilickeser to call when faced with a four-bet all-in, but he did and Buddiga tabled the dominating , which was powerless to stop a cruel ten that appeared on the turn, eliminating Buddiga. By the time Marc Wright was ousted in seventh, Kitai had already proved to all those watching what an incredible talent he was, by making the correct decisions in every single spot. Wright put him a difficult place when he raised all in on the turn of a board with for a double gutshot straight draw. Kitai tanked for more than five minutes before making the call with for top pair. It held and Kitai was clear at the top with nearly twice as many chips as his closest competitor. Mario Puccini hadn't been involved in many confrontations up until that point but he really stamped his mark on the final table, starting when he eliminated César García in a classic race that saw Puccini’s pocket queens hold against García’s ace-king. Both Puccini and Chen were eating into Kitai’s lead and it was the latter who took over top spot when he eliminated Kilickeser. Chen raised on the button, Kilickeser defended from the big blind with and the flop fell . Kilickeser check-raised all in with bottom pair, but Chen had flopped top pair with . Chen's hand held and Kilickeser was eliminated. André Morath hadn’t played many hands and when he did enter a pot, his opponents ran for the hills since he kept showing down monsters. He liked to defend his big blind with almost any two cards and that saw a lot of his chips migrate over to his three opponents’ stacks. He must’ve been over the moon when Puccini busted next. Puccini, who was the dominant player for some of the day, saw the wheels come off his tournament. He went from chip leader to out in fourth in less than one level. He was raised off pots, caught bluffing and doubled up Morath before his final hand. He decided to make a stand with and three-bet all in over the top of Kitai’s open. Kitai had opened with less than stellar cards numerous times but this time he had in the hole. He made the instant call and a safe board was revealed in front of them. Morath went back to leaking chips to the point where he felt he had to make a stand. He looked down at in the big blind and three-bet all-in after Chen raised from the button. Chen called with the dominating and the board belonged to him. The two remaining players went on a dinner break at this juncture and agreed a deal based on their chip counts. Chen locked up €613,000 and Kitai €632,000 with the eventual winner walking away with an extra €80,000. With EPT Berlin in the books, the next stop is Monaco for the PokerStars and Monte-Carlo®Casino EPT Grand Final. The PokerNews Live Reporting Team will be there to cover all the action from the €100,000 buy-in Super High-Roller event and the €10,000 buy-in Main Event.